This year for my birthday, which was back in April, I decided I was going to buy myself a new sewing machine. I have a basic Singer (which I got new 14 years ago), that could tackle most of my sewing projects but was slow and loud. I was also having trouble getting the Singer to sew thicker materials, like the coil vessels I've been making lately. A reader pointed me to a Forum (patternreview.com) which started my research for a replacement machine. Once I started reading about machines, it was clear that a vintage mechanical machine was the way to go for me -I needed a work horse. With sewing machines, the adage "they don't make them like they used to", certainly rings true unless you are dumping thousands (like upwards of 8K) for a new machine. This is because affordable new machines largely use plastic parts, whereas all those old machines use metal ones. Anyway, I'm not going to pretend I'm any expert, because I'm a total newb in this whole vintage sewing machine world. I did learn enough about vintage machines on this incredible site (Ashleyandthenoisemakers) to set my sites on a Bernina 830 Record. I got my machine on Ebay. It is from 1975. It cost me $320 (including shipping) and then I spent $125 to have it serviced by a technician here in SF. $445 for a forty year old machine, crazy right?! Let me tell you though, this machine is a Ferrari to my Volkswagen. It's fast, precise and quiet. 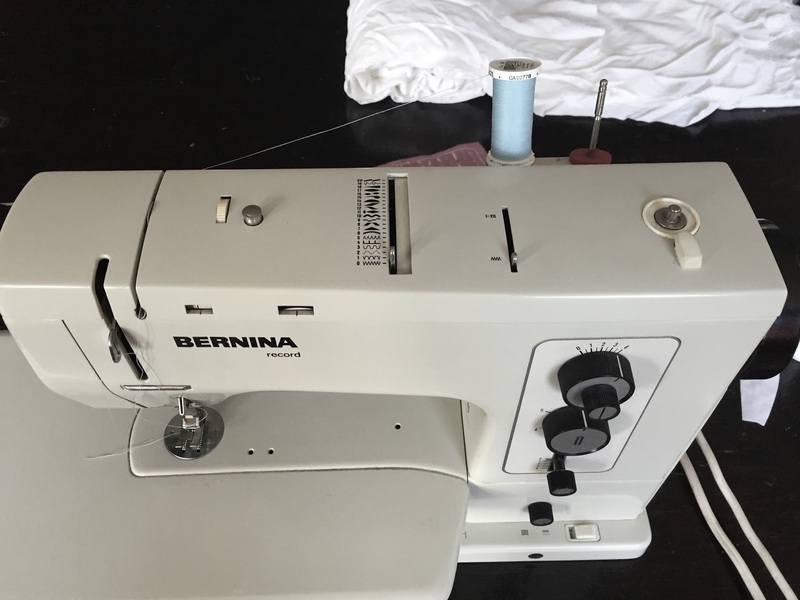 Some of the features I've noticed right away on this Bernina that I love are: A bobbin that goes on forever, reverse stitching that lines up with the forward stitches and speed, speed, speed. This machine has a bunch of fancy embroidery stitches that I haven't experimented with yet and also has an array of beautifully made presser feet for different hemming applications that I've just started fooling around with. 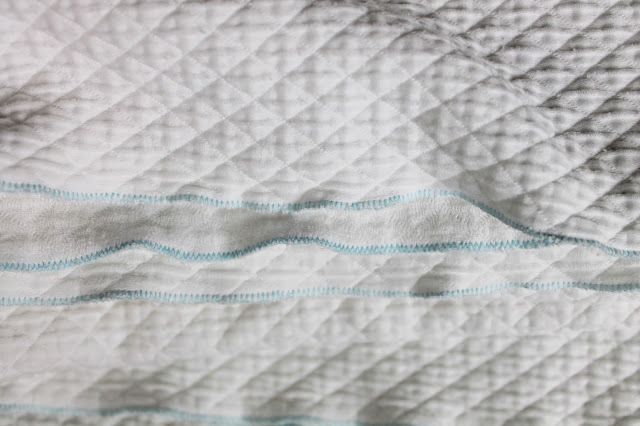 I'm still learning how to use this machine so I started with a few simple bedding projects. 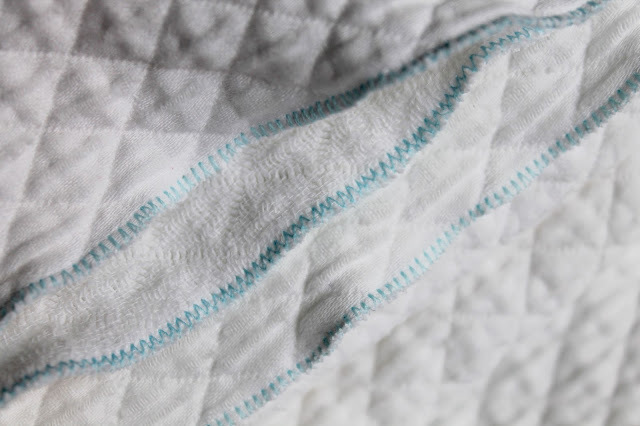 This metalasse fabric was from a comforter cover whose cotton backside disintegrated with wear. I cut that off and made it into a blanket with a zigzag edge. I also made these squares for my bed from some pale pink linen. I had just enough fabric for two of them. 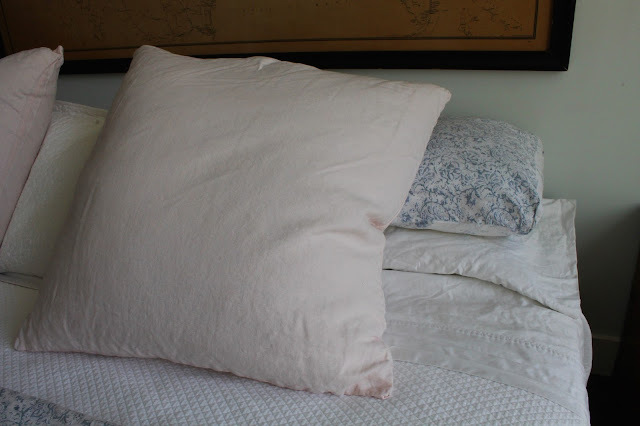 Usually I prefer a flange for bed pillows because without one a square pillow can look like it belongs on a couch, but in this case I thought the linen was dainty enough not to read that way. Also a bed pillow should not be too full -to also prevent that couch look, IMO. Just as an aside, I am also preferring under-inflated decorative pillows everywhere these days. This project only took a couple hours to knock out. 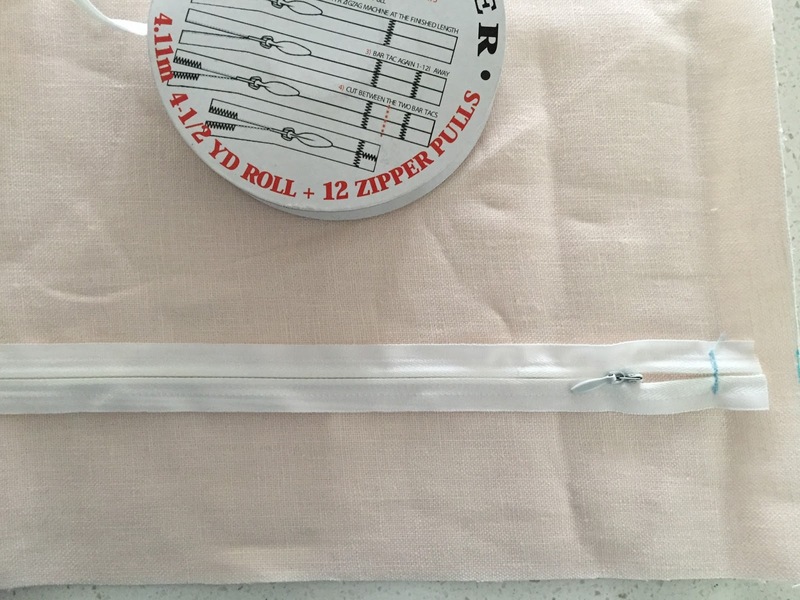 I've learned to keep zipper tape on hand so that I don't find myself unable to do a quick project for lack of zippers. I am partial to a invisible zipper application, I find them easier to sew. So, so far it's happy sewing times around here. I am in love with my new Bernina!